In 2014 there were 733 Series A rounds raised by U.S. seed stage startups (excluding biotechnology, pharmaceuticals, cleantech and energy startups for this analysis). The median Series A round size was $5M (average was $7.2M), and the median team size was 15 people at the time the round was announced, suggesting this might be the minimum viable team size for investors targeting a “run the fund” outcome (or at least 3x return). Bearing this benchmark in mind, I segmented the set of known Series A candidates and this post walks through the thought process I’d imagine and outbound deal sourcing associate at a venture firm might use to focus in on the most promising prospective deals. 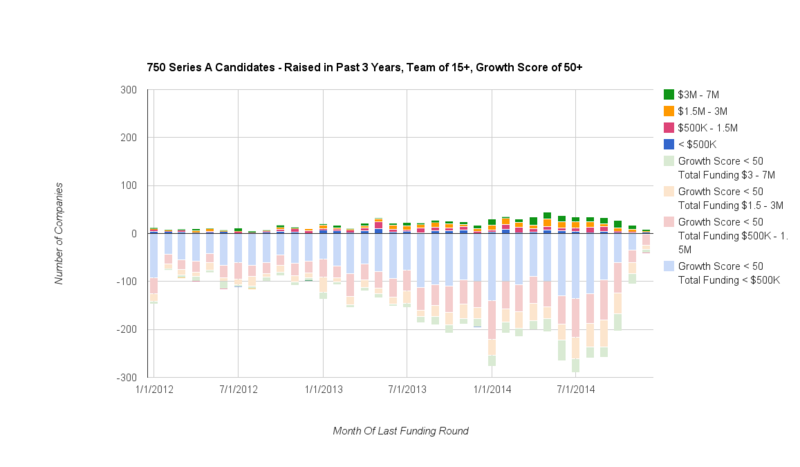 Assuming a similar number of Series A deals will happen in 2015, and that the majority of these companies will have already received seed funding sometime in the past few years, I can use Mattermark’s data to generate a list of “look alike” candidates for that next round of venture backing. First, let’s figure out the initial pool of opportunity we are drawing from.17,120 seed stage companies in Mattermark have some funding, but only 38% of them raised that money in the past 3 years. You’ll see there are companies below the X-axis; and for this first graph those are companies with a Mattermak Growth Score of less than 10. The assumption is that with such a large number of companies, investors will have at least a minimal requirement for growth signals from these companies. Only 4,298 (66%) made this first cut, with a current growth score > 10. Next, I wanted to start working toward a list of companies in the 700-800 range since that is roughly how many Series A rounds were raised by comparable companies in 2014. Rather than jump straight to the 15 employees cutoff, I thought it might make sense to take a look at the companies who had a team of at least 10. With fundraising taking 3-6 months, it would be reasonable to think the team might be smaller than 15 when the founders first began looking to raise a round. As you can see, many more companies fell below the X-axis with this filter, which also raised the bar on growth by requiring a score of at least 50. Of the teams currently meeting the 10 employees or more milestone, only 60% of them also enjoy a Mattermark growth score of 50 or higher. Only 1,220 (19% of the original 6,537) made the second cut, with a team of at least 10 people and a Mattermark growth score > 50. Finally, for the third cut I required that companies have at least 15 employees and a Mattermark growth score of at least 50. Of these companies, only 58% of them also meant the growth requirement and so we are left with 750 companies with a Mattermark growth score of at least 50, and a team of at least 15 people. As you might expect, these are concentrated around companies who last raised in the past 12-18 months but we also see some interesting outliers who have survived through profitability or possibly unannounced rounds. Only 750 (11.5% of the original 6,537) made the final cut, with a team of at least 15 people and Mattermark growth score of at least 50. To me, this is a visualization of the struggle I personally faced in 2014 as I failed to raise a Series A in Q1 and then successfully closed our round in Q4. For founders pondering what they need to do to be a strong candidate for Series A, I think it is important to think of team size as a signal. Starting a startup is too hard for one person. Even if you could do all the work yourself, you need colleagues to brainstorm with, to talk you out of stupid decisions, and to cheer you up when things go wrong. 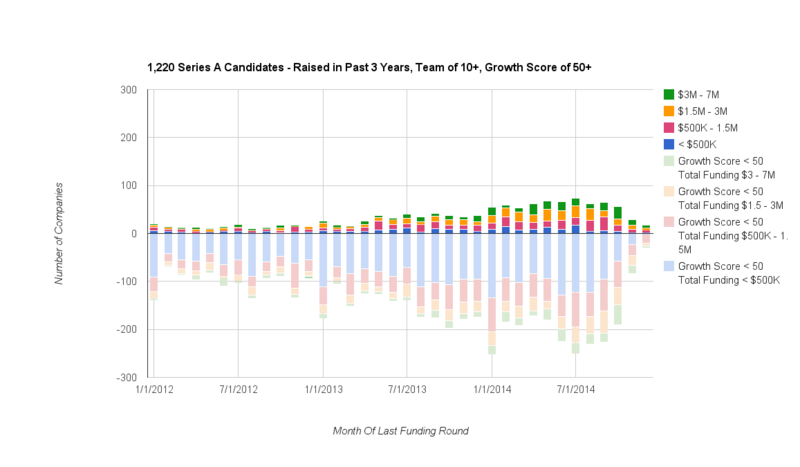 While this data does not prove the point of Graham’s wisdom, it does support the suggestion that there could be some connection (correlation, not necessarily causation) between growing to a healthy team size and surviving the the next funding round. 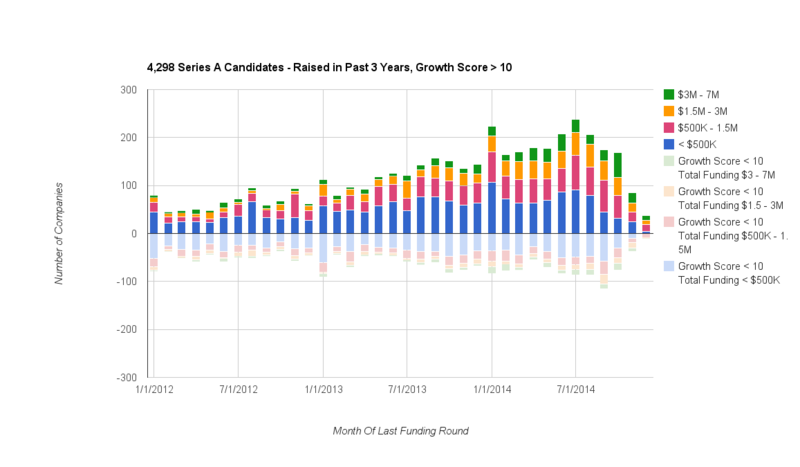 So, Who Are the Most Promising Series A Candidates for 2015? Estimote— developer platform for adding real-world sensors to applications (47 employees, Growth Score: 951). Full disclosure: I am an angel investor.